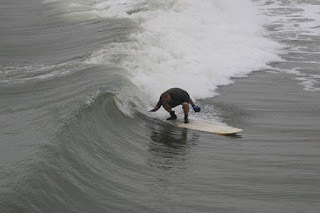 Reader Robert was checking the surf cam at Jax Beach Pier this morning and stumbled upon, "Booty web gloved longboard man head dipping a knee high piddler while not anywhere near the pocket." "crap I forgot to shave my balls this morning!" The saddest part is that he's wearing a fullsuit and boots in late May, in J-ville. What a fanook! !